I have never actually done a post on how to deep clean your brushes so the other weekend I put this together while I was deep cleaning mine. Some of the products I use are optional like the Baking Soda, Small Plate, and Sigma Dry & Shape. I have put together an alternative method that I used to use before I had my Dry and Shape for those who don't have one. It's important to clean your makeup brushes to prevent breakouts and infections. I spot clean brushes I use with dry products (eyeshadow, blush, bronzer, etc.) after each use. Liquid products I'm a bit more particular about and clean my brush after each use instead as I break out really easy. 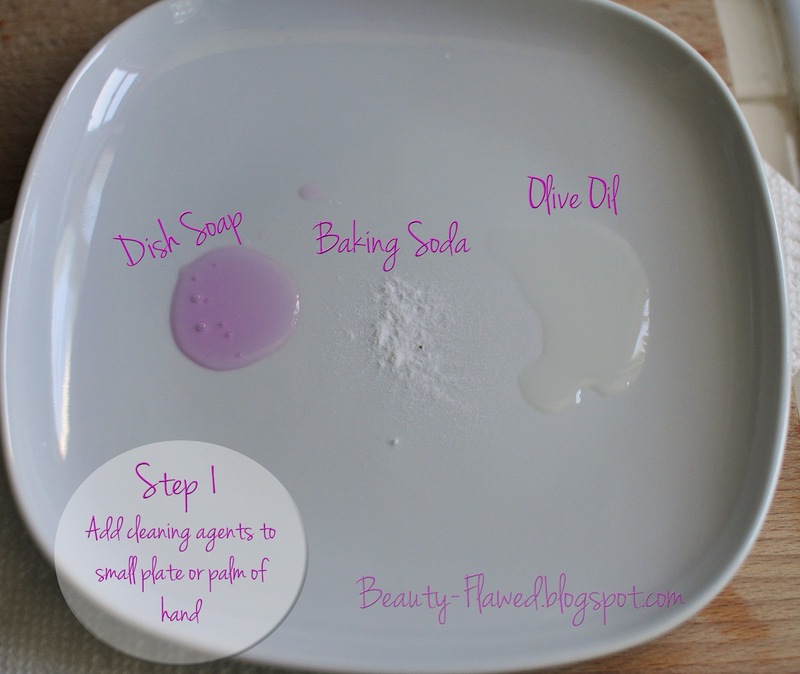 What you Need: Dirty Brushes, Dish Soap, Olive Oil, Paper Towel, Baking Soda (optional), Small Plate (optional), Sigma Dry & Shape (optional). I use baking soda on brushes that have foundation or products that can stain, a little goes a long way and helps keep brushes looking like new. I also use a small plate to press the brush against when cleaning and rinsing, if you don't want to use a plate the palm of your hand works just as well. The Olive oil mixed into the soap helps condition your brushes and keep them feeling soft. I have also seen people apply olive oil on their brushes after cleaning but for me I don't like the way that leaves them feeling so I mix it in. You can use either method to keep the type of conditioning you like for your brushes. If you want to do multiple brushes use more or less product. I set this up for one brush for demonstration purposes. Wet your dirty brush with luke warm water and then begin swirling it into the cleaning agents continue to do this until most of the product that was on the brush is worked out. Gently rinse soap out of the brush by pressing and swirling against the plate (or palm of hand) with luke warm water. Repeat until the brush gives off no more soap bubbles and runs clear. Once rinsed clean gently ring out any excess water. Set brush aside on the clean paper towel until your ready to set up your drying station. 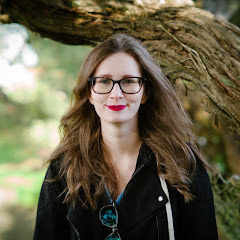 This is what I did before I had a Dry and Shape. 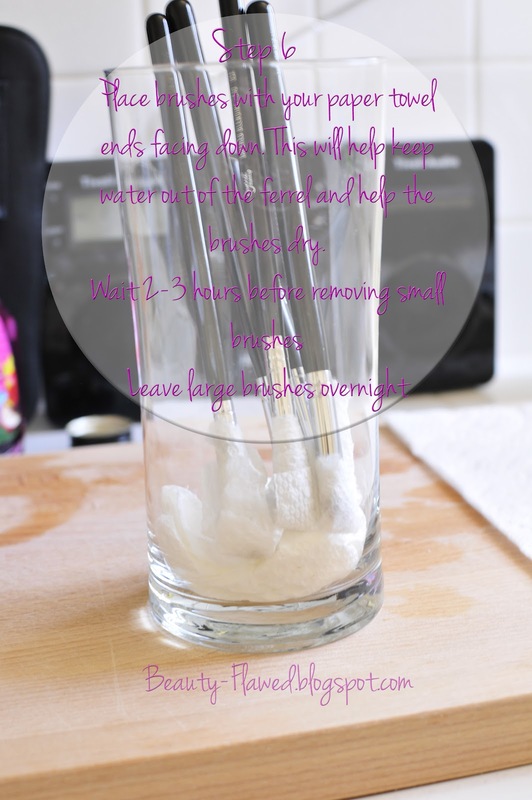 Take a large glass that is tall enough to hold your brushes up. 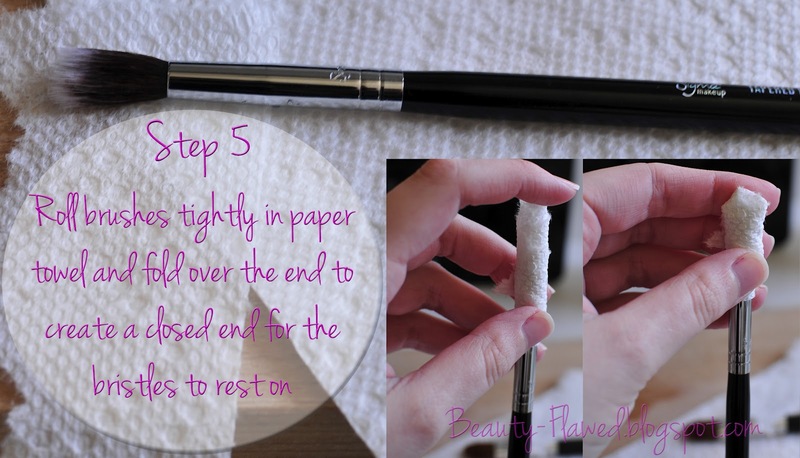 Next fill the bottom with dry paper towel and create a nest for your brushes to rest on. Next rip some paper towel into stripes and roll your brushes tightly. Once rolled fold over the top where the brush ends to create a closed end for the bristles to rest on. Once rolled and folded over place the brush bristles down into the glass. Leave for 2-3 hours for small brushes and overnight for large ones. I still use this method on some of my smaller yet fluffy eye brushes since my dry and shape doesn't have many spots for smaller brushes. This also works with large brushes. Rolling them tightly in paper towel while they dry helps them maintain their shape and gives your brush a longer life. You always want to dry your brushes with the bristles downward so no moisture gets left behind in the ferule. Also when rinsing try your best not to get water above the metal edge of the ferule otherwise your may find that your brush handle will begin to loosen over time. I like to use luke warm water because it's a happy medium too hot of water can also loosen the glue on your brushes. You can also use this method with brush cleaners if you don't want to mix this up, I do use that sometimes if I'm in a pinch for time. Hope this is helpful Happy Friday everyone! How do you wash your brushes? Love the Dry n' Shape! I use dish soap on my brushes (the kind with vitamin E in it that's supposed to be more moisturizing) though I've never tried it with olive oil...I will have to try that! Me too it's so convenient! I am SO bad about cleaning brushes and def will put this tutorial to use. Thank you for confirming that there'll be birchboxes inspired by gossip girl this month! I am looking forward to it because it'll be like my 3rd good box that I've received but 19 variations??? AHHH! Glad it was helpful! Yeah it's looking crazy you'll have to post yours when you get it so we can compare! such a useful post, thanks will use it from now on! I sometimes use baby shampoo too, it works great! This is such a great idea! Thanks for the post, I'm usually pretty lazy about cleaning my brushes and I really need to get better at this! Great post. Will try this. For 1 brush you use everything? (soap, oil and baking soda) Do you have any issues with the oil causing breakouts; I have sensitive skin. For my brushes that are a bit stained I use all three, depending on how many brushes your washing you can use more or less. Mixing the oil with the soap ensures that while it will condition it wont leave behind any oiliness on the bristles. I haven't had any problems with my skin breaking out from the oil I have pretty sensitive breakout prone skin as well. The olive oil will definitely help bring them back to life. 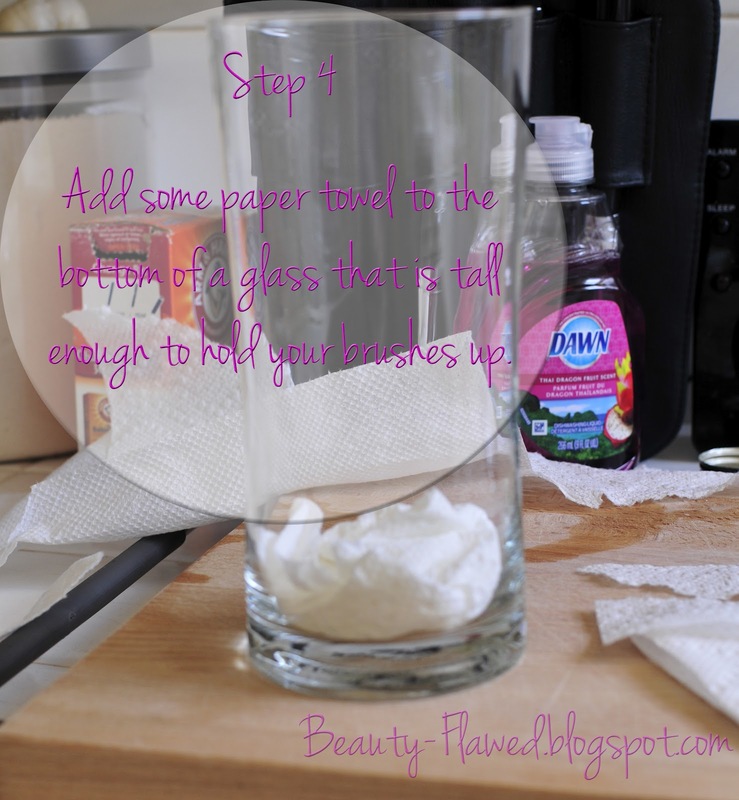 I always use baby shampoo and baby oil...but I shall try this out, and great tip about using paper towels and putting them in a glass to dry them! Thanks that was my go to method before I got my dry and shape. Great tutorial! 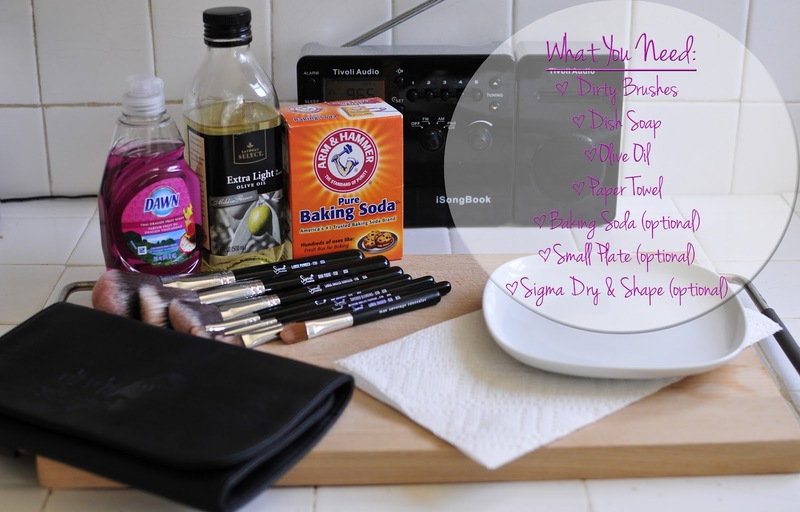 This is basically how I clean my brushes as well, but I haven't added baking soda to my mix. I'll have to try that with my white bristled brushes. It will really help keep your brushes sparkling clean! Id been using a brush cleaner if I'm just cleaning one but for a lot at a time I find this works much better for getting everything out of the bristles. I've also noticed that the synthetic bristles are a lot more stain prone than natural one, the baking soda works great for taking foundation color out of them. My brushes are in a serious need of deep cleaning. I should probably do that, soon!